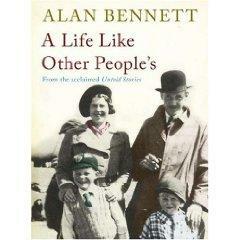 This is a very touching and down-to-earth story of his own family by the famed British dramatist, Alan Bennett. Known and loved for his work on Beyond the Fringe, numerous stage shows, as well as books including “The Uncommon Reader”, Alan Bennett is completely frank in describing his growing up over a butcher’s shop in the manufacturing city of Leeds, Yorkshire. His father ran the shop. The house had no front hall. It did have great affection between his parents, his brother and himself as well as happy, often hilarious times, with a pair of unconventional aunts. All this came to an end when the family moved to a small nearby village – “to be in the country”. His mother was stricken with depression and later dementia. His father had to learn to drive a car and made the 50-mile round trip to the hospital every day. Bennett has written the true and heart-breaking story of “care-giving”. He does it without any of the “splother” that his family despises, and it is very affecting and courageous in its frankness. Not a jolly book for Christmas – but a good one just the same.